Calefax takes an adventurous approach to presenting its programmes and has an astonishingly varied repertoire ranging from 1100 to the present day. 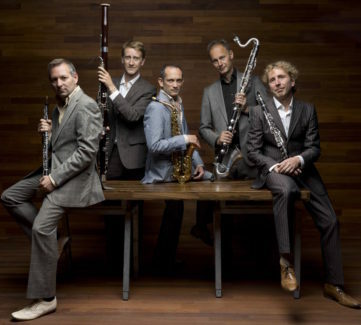 They perform their own arrangements and newly commissioned compositions for the unique combination of oboe, clarinet, saxophone, bass clarinet and bassoon. Calefax is open to the influence of world music, jazz and improvisation as a result of countless international tours and collaborations with all kinds of musicians. These have included the pianist Jean-Yves Thibaudet, singers Nora Fischer and Cora Burggraaf, trumpeter Eric Vloeimans, violinist Liza Ferschtman, clarinettist Kinan Azmeh and the Nederlands Kamerkoor to name just a few. Calefax also regularly joins forces with artists from other disciplines, such as theatre maker Boukje Schweigman and video artist Jaap Drupsteen. Reed quintets have been formed throughout the world, following Calefax’s example. The group reinforces its pioneering role by publishing sheet music of their own arrangements under the name Calefax Edition. Calefax pushes the boundaries, creating an inspirational laboratory with its annual PAN-festival: a colourful potpourri of musical exploits, with surprising excursions into other artistic disciplines and a composers’ competition. They have collaborated with the pianists Jean-Yves Thibaudet, Ivo Janssen, Louis van Dijk and Michiel Braam, violinists Liza Ferschtman and Claude Chalhoub, singers Lenneke Ruiten, Christianne Stotijn, Helena Rasker, Nora Fischer, Cora Burggraaf and Denise Jannah, trombonist Christian Lindberg, the Tony Overwater Trio, Cappella Amsterdam, Danel Quartet, Zapp4, the Nederlands Kamerkoor, trumpeters Eric Vloeimans and Marco Blaauw, percussionist Arnold Marinissen, clarinettist Kinan Azmeh, choreographers Boukje Schweigman and Sanne van der Put and visual artists Jaap Drupsteen and Wouter van Reek. Calefax also performed for the soundtrack of the 2013 Dutch film De nieuwe wildernis. Calefax has released 19 CDs under the renowned German MDG label and its own RIOJA Records label. All the recordings have earned critical acclaim from the international press. The mezzo-soprano Cora Burggraaf can be heard on the CD entitled The Roaring Twenties,while the On the Spot CD features the trumpeter Eric Vloeimans, who transports Calefax into the world of jazz and improvisation. Calefax’s latest CD, entitled Romantic Kaleidoscope, was released in October 2015, packaged within the anniversary book Calefax en de Caleidoscoop, written by the radio presenter Lex Bohlmeijer and published by Cossee.